Consumer credit, of course, has lately earned bad marks for excess, but that industry has nothing on plastic. 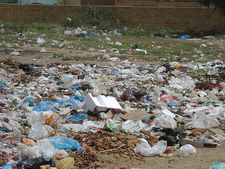 When it comes to plastic bags, we are past frivolous waste, past pointless indulgence, well into gluttony. Americans use 380 billion of these things every year. That’s about 1,000 per person per year. Three bags a day, every day, for every man, woman and child in the land of the free. When I mention this number to people, as I often do, they cluck like hens when they see grasshoppers getting away. It’s clearly undesirable. Like public belching. But what can be done? Clerks make a big show of shaking their head in chagrin as they stuff my purchases into a, yes, plastic sack. “No bag?” As if I were arguing against use of toilet paper. “I can carry this fine, thanks,” I promise, “this” usually being something big such as thread, or dangerous, such as a peach, or valuable, such as oatmeal. I figured propriety was behind the “law” about liquor in a sack, until I called the state’s Liquor Control Commission out of curiosity and discovered there is no such law. “A common myth” are the exact words. Well, so what? Yes, litter is a problem with plastic bags—you see them everywhere, and I mean everywhere. Every country, every town, every fence, every field. Sooner or later global warming will melt the snow on Mount Everest, but no worries: It will remain white from all the Safeway sacks that have blown there. But there’s another problem—bags consume hydrocarbons. The whole country is crying and moaning about the energy problem, and here we are squandering the stuff on sacks. An enterprising class at Indiana University figured out how much: 1.6 billion gallons of oil goes into plastic sack manufacture. That equals 38 million barrels of oil, which is equal to… Well, let’s really put it in perspective. It’s four days of petroleum imports into the United States. Just for bags. It roughly equals our annual import of oil from Brazil, so if we, just supposing, reduced plastic bag consumption 90 percent, we could tell Brazil to stick it. Wait—we like Brazil. OK, for one month we could tell Hugo Chavez in Venezuela to take his oil and put it where the sun don’t shine. And Iraq? We could do without Iraqi oil for four months, just in case that idea makes any difference to national policy, which I know is a silly notion. We’re in Iraq on principle. I’m just saying. But reducing plastic sack consumption 90 percent is a pipe dream. Not in our house. I got on this bandwagon a couple years ago; my wife and stepdaughter have joined in, and we’re acquiring so few plastic sacks that the other day, when I needed such a thing for some garbage, I couldn’t find one. We are falling far, far short of our U.S. household allotment of 3,000 bags a year. We might use three a week now. Some weeks, none. We keep cloth carry sacks in the car so we remember to actually take them in the store. We tuck them in our suitcases to use when traveling. No calamity has befallen our family yet. And I’m refining my speech to store clerks. The other day I bought a book and the cashier thrust it into a bag six times the size of the book, a plastic sack big enough for Mafia use. “That’s a lot,” she clucked. Then she handed me the sack. I took out the book and gave her the sack back. “You don’t want this?” she asked, as if we hadn’t just discussed how unnecessary it was.